UltraWind P1 Seal features polyurethane design that is resistant to cumulative impact of abrasive forces caused by varying loads and speeds. Also resistant to effects of temperature fluctuations, precipitation, and debris, seal prevents lubrication leakage and bearing contamination. 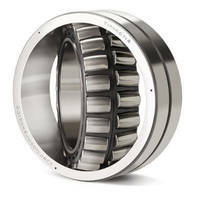 Flexible sealing lip handles any misalignment or run-out in application of bearing while also minimizing heat generation and cone wear and accommodating bearing deflections. CANTON, Ohio -- The Timken Company (NYSE: TKR) continues to expand its comprehensive line of wind-energy products and solutions with the introduction of the Timken® UltraWind P1 Seal, a breakthrough wind-turbine bearing seal with a polyurethane design that provides increased resistance to abrasion for longer wind-turbine service life and more robust performance than most other commonly used sealing materials. Timken is introducing the new seal this week at the American Wind Energy Association's Windpower 2011 Conference and Exposition in Anaheim, Calif.
"Seals play an integral role in maximizing wind-turbine uptime and productivity because of their ability to prevent lubrication leakage and bearing contamination," said Hans Landin, director of Process Industries original equipment and wind energy at Timken. "However, over time the cumulative impact of abrasive forces caused by varying loads and speeds, as well as extreme temperature fluctuations, rain, snow, debris and lubrication challenges, can dramatically reduce seal performance in wind-turbines. The new UltraWind P1 Seal is designed to address this problem by incorporating the latest polyurethane technology." -- A corrosion-resistant, stainless steel garter spring that helps prevent rust. -- A cross-sectional size of 25 mm x 32 mm so the UltraWind P1 Seal designed to easily retrofit standard elastomer seals. "Wind-turbine owners and operators require the latest, most advanced technologies to help achieve optimal uptime, performance and return on investment, which is why they turn to Timken for seals and other highly engineered wind-energy products," said Landin. "Timken's new UltraWind P1 Seal will prove to be an important tool in the reliability arsenal of wind-turbine owners and operators." For a look at the new UltraWind P1 Seal, as well as Timken's full suite of wind- energy aftermarket products and services, stop by Timken's booth (number 4435) during this week's American Wind Energy Association's Windpower 2011 Conference and Exposition.